How about feeling royal as you sight-sleep iN the Parador of Cardona iN Catalonia, Spain with iNSIDE EUROPE? The Cardona Parador is part of our iNSIDE EUROPE Sight-Sleeping Collection. When iN Catalonia, make sure to venture outside of Barcelona, too – to magical places along the roads less traveled, like the small town of Cardona which is towered by an impressive medieval castle that is also home to a one-of-a-kind hotel, the Parador of Cardona. The Castle of Cardona is arguably the most important medieval fortress in Catalonia and one of the most important in Spain. It is situated on a hill overlooking the valley of the Cardener river and the town of Cardona. A little bit of castle history: The fortress was initially constructed by Wilfred the Hairy in 886 and occupied by the dukes of Cardona from the 11th to the 15th century. It proved to be one of the strongest castles in the area and even after many of the castle walls were destroyed in 1714, it was one of the last to surrender to King Philip V.
Cardona Castle can be visited, but not on Mondays! The castle’s main jewel reamining is the torre de la minyona (from the 11th century) a tower, which is 50 feet high and 30 feet wide. Additionally, there is the Romanesque Church of Sant Vicenç de Cardona adjacent to the fort, where the Dukes of Cardona are buried. The fort is currently used as a parador, a state-run luxury hotel. Movie buffs among you will recognize the castle from the Orson Wells film ‘Chimes at Midnight’. A parador iN Spain, is a boutique hotel, usually located in a converted historic building such as a monastery, castle, or mansion. The Parador de Cardona – just like the Parador of Cuenca – is part of our iNSIDE EUROPE sight-sleeping collection iN SPAIN for many great reason, but mainly because here you will feel as if you just traveled back in time to the Middle Ages! 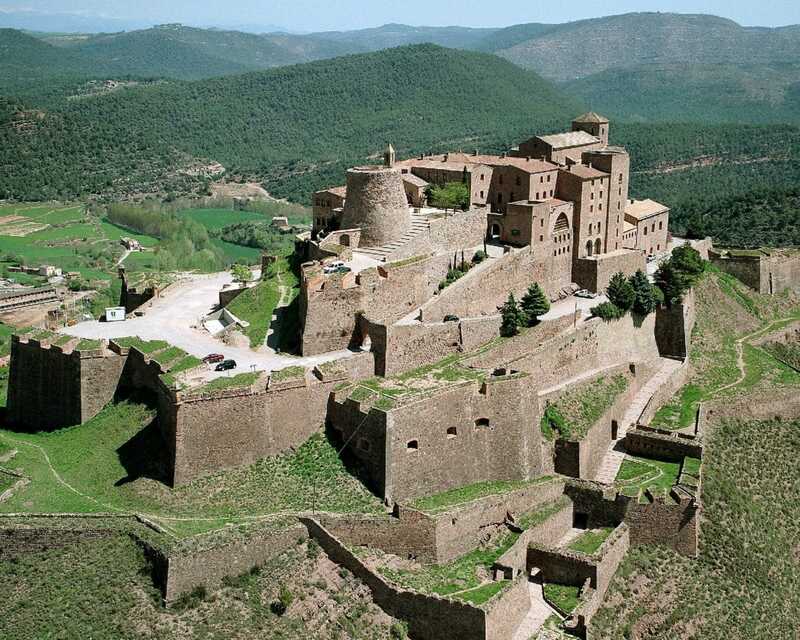 This hotel is a magical medieval castle with centuries of history, standing high atop a promontory and watching over the charming town of Cardona and the Catalonian countryside. The Parador’s interiors are faithful to Cardona’s history with medieval styling complementing the castle’s vaulted ceilings, stone walls and gorgeous courtyards. Some bedrooms have charming canopy beds and you’ll discover well preserved Gothic features throughout. Furnishings are inspired from the medieval period and are highlighted by theatrical lighting and special fabrics. All stately rooms come with free Wi-Fi, flat-screen TVs and minibars. Catalan and international food is served in the medieval dining hall for breakfast, lunch and dinner. Plus you will enjoy wonderful views of the Cadí Mountains, Mount Pedraforca, Mount Montserrat, and the town of Cardona. Staying here is an unforgettable experience and fun for travelers of all ages. And ohhh, the buffet spread awaiting you in the mornings with a myriad of choices from sweet to savory! Parador breakfasts are some of our all time favorites!